The hottest August the world ever spent was like winter in San Francisco…. The often-repeated Mark Twain quote that Mark Twain never said (in writing at least) about the “coldest winter I ever spent” took on a special significance in August 2016. Global warming factors resulted in August being the hottest month ever recorded on planet Earth. Meanwhile in San Francisco, a combination of fog, cool ocean air, and low pressure from the Central Valley gave our fair city a record-setting cold August — a month in which the temperature in downtown San Francisco never once went above 70 degrees. In fact, August 2016 in San Francisco was colder than February 2016 in San Francisco. The contrast in climates has never been more drastic than what we endured in the month of August this year. According to NASA’s Earth Sciences Division at the Goddard Institute for Space Studies, August 2016 had the highest global temperatures of any August ever recorded. 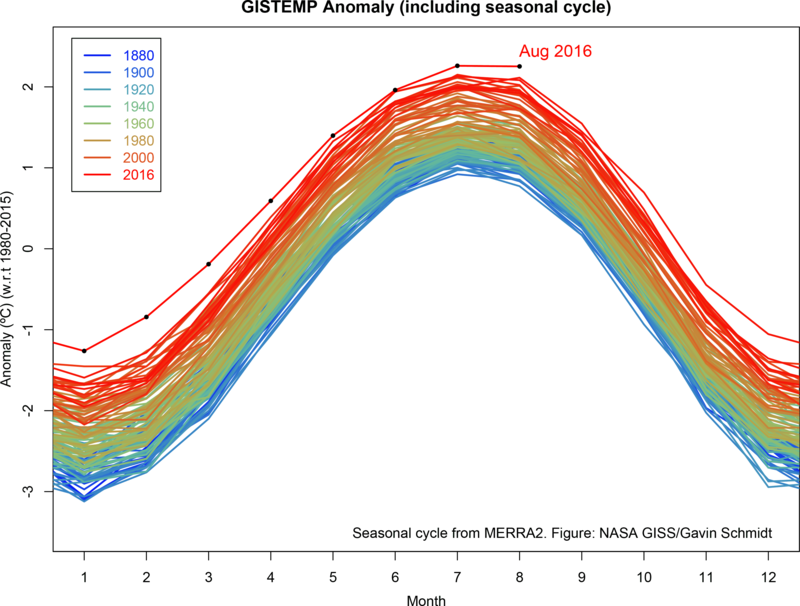 August also saw the hottest average global surface temperatures of any month in the 136 years for which NASA has global temperature data. Technically, August was not the single hottest month in the recorded history of the planet, because it tied with July 2016, with global average surface temperatures about 0.18 degrees Fahrenheit warmer than the previous all-time hottest months ever recorded (July 2015, 2011 and 2009, respectively). This marks the 11th consecutive month of record high global temperatures for that particular month, according to NASA’s data collected from 6,300 meteorological stations located around the world. But here in San Francisco, we shivered through the coldest August on record since 1942. While the temperature did exceed 70 degrees in some parts of the city on August 8, the temperature downtown never got above 70 degrees the whole month. The entire month of “Fogust” 2016 gave San Francisco an average daily high temperature of just 65 degrees. That’s down from the city’s historical average daily high temperature of 68 degrees. July and August are traditionally among our chillier months, thanks to San Francisco’s geographical placement on a peninsula and the low pressure created by the heat of California’s Central Valley. But one factor drives our late summer temperatures even lower. “The big, cold ocean right next to you,” National Weather Service meteorologist Susan Sims told the Chronicle. But the way things are going on the rest of the planet, let’s just hope that big ocean somehow manages to stay cold.